Basic concepts need to be understood in order to avoid misunderstanding. Every science uses certain terms which are commonly used in ordinary language. When they are used in scientific discussion, they are assigned specific and scientific meaning. All around us, we see people going to work every day. They are employed in different places but their goal is common ie to earn an income to satisfy their multiple, ever increasing and therefore unlimited wants. They are undertaking “economic activity” ie “income earning and income activity of man”. 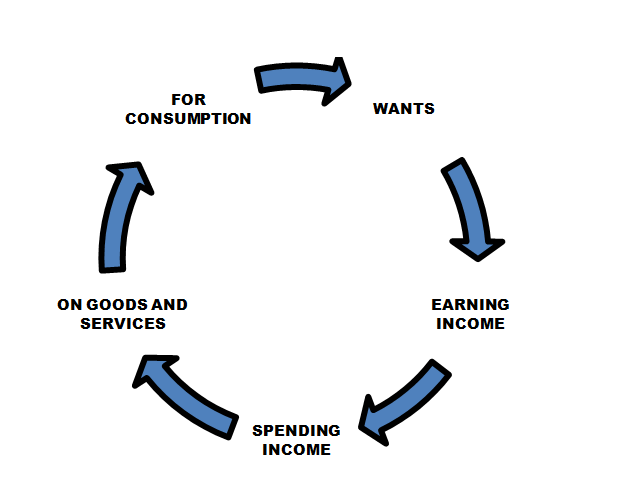 While earning income they are producing and while spending the income they are consuming. In other words they are undertaking “productive activity” ie “the activity of production and consumption”. Therefore both economic activity and productive activity take place simultaneously. Man has unlimited wants. To satisfy them he undertakes economic activity so he earns income, spends it in the market to buy goods and services. He consumes the goods and services and satisfies his wants.